Ideas come to me when I am out and about in glorious Brisbane taking photos to share with you and that's how I came up with my idea to share my favourite things to do in Brisbane each month. So today I start with a short list of my favourite things to do this April in Brisbane. April mornings are cool and crisp and the sun is rising later which means you don't have to get up super early to catch a glorious Brisbane sunrise. Go on make the effort I'm sure you won't be dissappointed. The Jan Powers Farmers Markets in front of the Brisbane Powerhouse, Lamington St Newfarm are on every Saturday of the month from 6 am till 12 noon. Shop local and buy fabulous fresh produce such as these delicious apples from Stanthorpe, flowers, bread, meat, fish, poultry, plants and more. Currently there are 4 local Brisbane Farmers Markets; the Brisbane City Markets, Powerhouse, Manly Farmers Markets and Mitchelton Markets. Four legged furry friends are more than welcome at all Jan Power's Farmers Markets, except the city. South Bank Parklands is decorated with strings of red lanterns during April to celebrate the Buddha Birth Day Festival. Take a wonder along Clem Jones Promenade or thru the Grand Arbour under the dazzling red lanterns. By the way the lanterns also look stunning at night and are only dazzling us till 30 April. Stoke Bar, part of Stokehouse Q at South Bank Parklands, is the perfect place to admire the river views while you sip on an Autumn cocktail. This seasonal cocktail range comprises the best produce and is designed to match Brisbane's subtropical climate whilst capturing the colours and flavours of the season. The Sugar Spin: you, me, art and everything exhibition is your chance to explore GOMA and enjoy her artworks from brand new to old favourites from the past 10 years. The exhibition features over 250 contemporary artworks exploring light, space, architecture and the senses. From fluffy walls to fairy wrens absorb these amazing artworks for free till 17 April only. 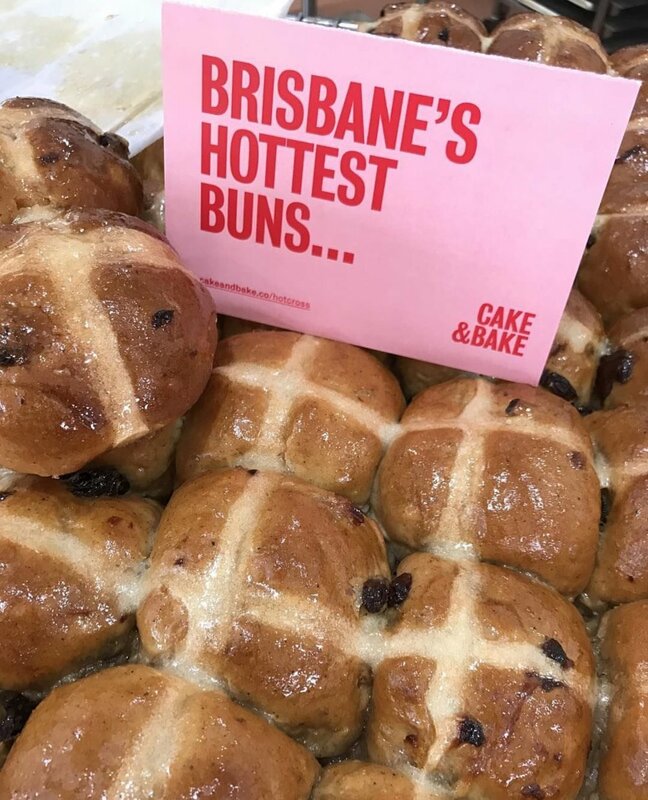 Hand made daily (in the weeks leading to Easter) by Jocelyn Hancock and her team at Cake & Bake West End these delicious hot cross buns are commercial preservative and additive free and taste amazing. Hop into Cake & Bake and enjoy some this Easter. Happy April everyone, let me know what you plan to do this April.